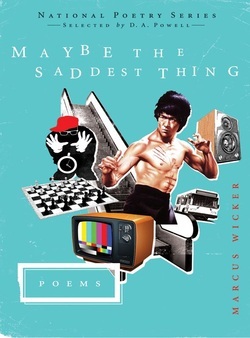 I’ve been waiting for Marcus Wicker’s debut collection Maybe the Saddest Thing, winner of the 2011 National Poetry Series, the way my partner waits for the next Pacquiao fight, the way we wait for any work of art to reveal better versions of ourselves, and I imagine I’m not the only one. He’s the kind of poet who makes you want to write, the way his music sounds like no one else’s, his images joyful and fearless, the way his heart translates into the wildest leaps you can imagine. This summer when a poet friend who thought I needed some cheering up read Wicker’s poem, “The Way We Were Made,” I realized how starved I’d been for a voice that honest, one that would convince me of the world’s beauty—“what is sweet in every wrong way”— not its flawlessness but the mess and ache. Maybe the Saddest Thing is a collection that celebrates the messy and uncomfortable, from public gaffes (Justin Timberlake at the 2004 Super Bowl) to private moments of humiliation (middle school), praising the ways in which we fail. Failure is a sacred contract, giving us permission to enter the poems as imperfect beings, to stumble as we question and interact with issues the poems explore. While complicating and questioning these issues, the speaker always reveals his own shortcomings, using self-deprecation like the best stand-up comedians, to get us to look at ourselves. These lines echo what comes into the poems again and again, the distance between how we see ourselves and how we’re seen, and the courage it takes to live at this threshold. Many people don’t write about race, I imagine, because it is so hard, because it feels like there should be a right thing to say, making it impossible to be authentic. The poem acknowledges this obstacle to authenticity in its form, beginning again and again, using the false start to push the poem past levels of comfort or predictability. When halfway through the poem the speaker says, “This isn’t working, is it?” it’s the moment of surrender when the poem opens up and exposes its heart. from your sandbox. Now—about that brew. The poem is at once gorgeous and self-conscious of its gorgeousness, a nod toward the unsayable, and how urgent it is that we say it. As in so many of the poems, Wicker is sincere while making fun of his earnestness, always risking the moment of “can I get away with this?” and doing it. gig saves us both tonight. Likewise, Wicker’s exquisite narrative chops give the sense of associative meandering, coaxing us into forgetting that each tiny step has been choreographed, leading us to the place of astonishment where we look back and see the path we’ve been treading is illuminated. The poems in Maybe the Saddest Thing remind me of what Baldwin said about how writers reach a point where they must reinvent language. Wicker masterfully presses up against the limits of the figurative and lyric, presenting a voice in flux between dazzling and stripping down, showing us all that language can do and every beautiful way in which it fails. What is so addictive about Wicker’s poems is that his wisdom and empathy go beyond seeing one’s self in another. He gets that “all humans want to understand everything / and for everyone to understand us” — that in the same poem a speaker can say: “As if I am not them” and then later, “And how sad it is because I am really not them” and how both are true. After reading the collection, I realized what I had been waiting for was this feeling: to look up from the poem and say, it’s good to see myself again.